Sketched Aug. 10, 2:29 p.m. 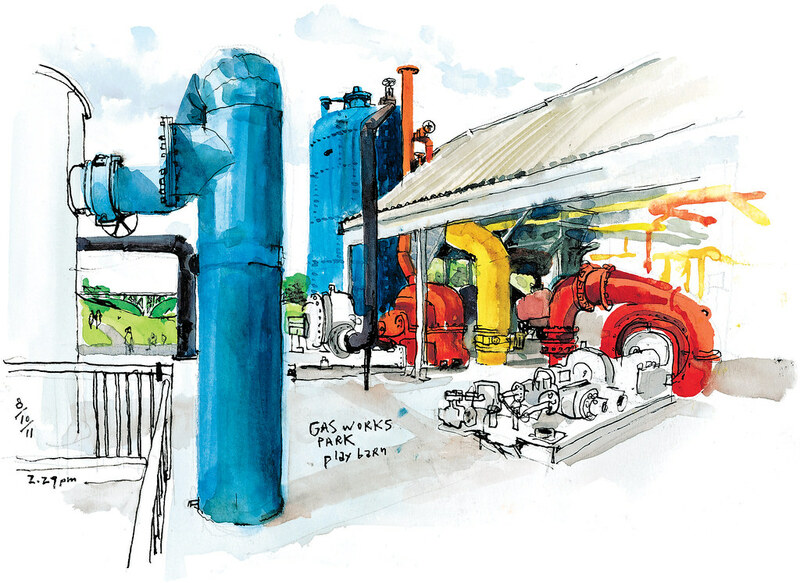 The labyrinth of steel pipes and boiler towers in the Gas Works Park play barn is getting a colorful facelift. Originally a compressor room when the plant operated from 1906 to 1956, the space became a brightly-painted play area when the park opened in 1975. “It was a real transformation of a grim industrial facility into a real children’s play area with a carnival-type atmosphere,” said Patrick Waddell, a member of Friends of Gas Works Park. Over time, layers of grafitti and patches of mismatching paint muddied the fun palette, but last month Waddell’s group persuaded the city to restore the Dr. Seussical colors. Parks Department paint-crew chief Chris Reed this is the first end-to-end paint job in the barn since 1985. For park visitor Amy Coughlin, 33, the change brings back memories of playing here as a kid. “It’s pretty awesome,” she said. Sketched Aug. 10, 3:40 p.m.
New brown paint on some other park structures is also noticeable. Reed said they were painted the last week of June to get the park ready for 4th of July, which is something they do every year. 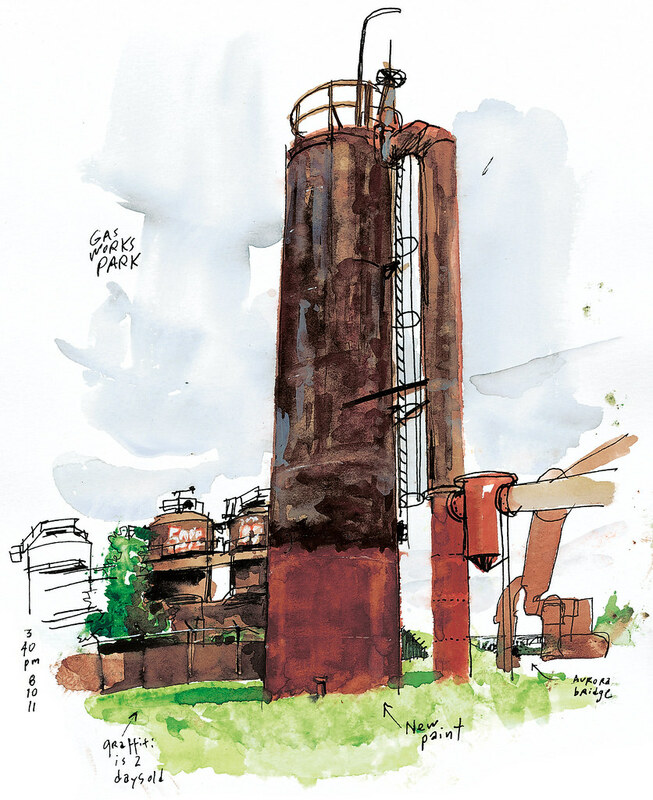 The ultimate goal, he said, is to cover them all in a uniform coat of brown to deter graffiti, but resources and time are limited, which explains why this tower I sketched didn’t get the full treatment.